When most people think of oil development in the United States they probably picture the iconic oil fields of Texas or California, or the frontier oil patches of Alaska or North Dakota. Few would immediately think of Florida, yet the Sunshine State has a rich history of developing this valuable natural resource dating back to the 1940s. What’s more, Florida has the potential to play an even more important role in our energy landscape. The responsible development of our oil and gas resources has had an enormously positive impact on energy security, jobs, environmental stewardship and technological innovation throughout the United States. Florida can and should continue to share in such benefits. The largest producing area in Florida is the unitized Jay Field, which has been producing oil and gas since it was discovered in 1970. The Jay Field is located in the Smackover Trend in the northwest Panhandle of Florida and extends into Alabama. 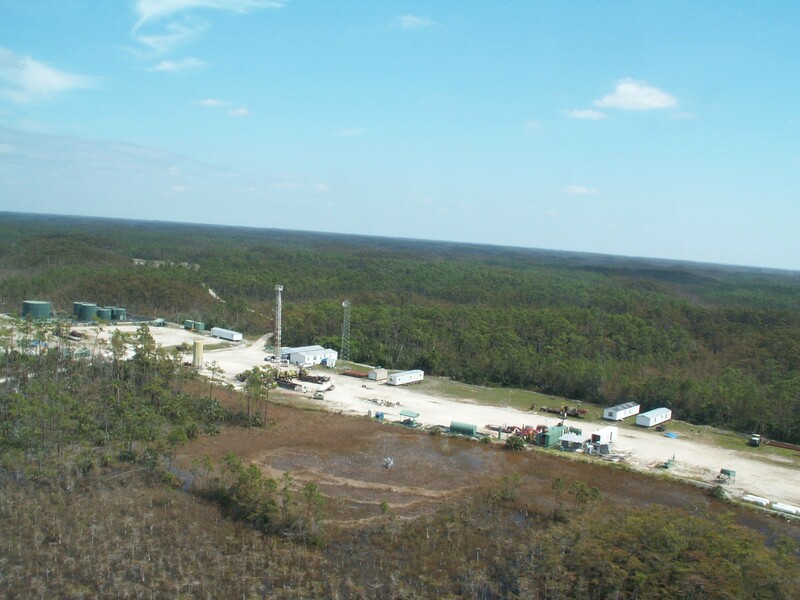 As of July 2015, approximately 65 percent of Florida’s oil and gas production came from the Jay Field. The Sunniland Trend, which encompasses a string of fields located in the Southwest area of the state, has been producing oil and gas since the 1940s. Geological formations do not stop at state borders, and Florida’s geology is no exception. The Jay Field reservoir dates back to the Jurassic period. This dolomite and limestone reserve is located more than three miles below the surface at 16,000 feet. The Sunniland Trend is made of “a porous, early Cretaceous limey marlstone” located more than two miles deep at approximately 11,300 feet. Dolomite, limestone, and marlstone – all of which are durable rock formations – are found in Florida, other oil producing states in the U.S., and around the world. While Florida’s geology is not unique, it is different from recent shale plays like the Marcellus (in the northeast), the Bakken (in North Dakota) or the Barnett (in Texas), where oil and natural gas are located within non-porous shale rock that usually must be hydraulically fractured in order to release and produce hydrocarbons. On the other hand, the Sunniland and Jay formations contain pockets of oil in porous limestone formations that do not need to be fractured to produce oil. In fact, to date, Florida producers have not needed to use any hydraulic fracturing at all to produce the oil and gas reserves located in the state. Just because the wells in Florida aren’t being hydraulically fractured doesn’t mean that they are purely vertical. Most wells are directionally or horizontally drilled, similar to drilling in “non-conventional” shale plays elsewhere in the country. While in most cases horizontal or directional drilling makes economic sense, in all cases it has an important and positive effect on Florida’s environment and ecosystem. According to the EPA, the practice has been used since 1891 with it becoming more commonplace in the 1980s. 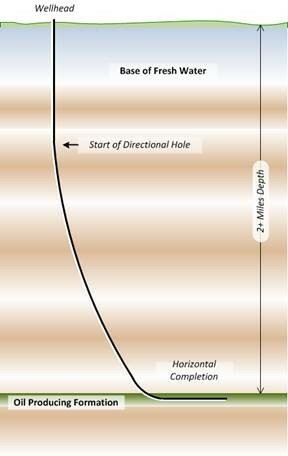 The following image helps to show how directional or horizontal drilling is used to reach great depths, without impacting a large area of land. Florida producers have been using horizontal drilling techniques in the Sunniland formation for nearly 20 years. This drilling technique allows an operator to drill multiple wellbores from one location or pad – instead of drilling multiple wellbores from multiple locations – thus limiting the number of locations necessary to conduct operations. The process also allows operators to access formations below limited or restricted surface areas directly above the reservoir from remote drilling locations. Recent advances in the technology to drill directionally or horizontally have also opened up reserves that weren’t considered developable previously and helped to spark new interests in the state. Even the radical anti-fracking environmental group Earthworks acknowledged the environmental benefits of horizontal drilling for local ecosystems, before it abruptly changed course and decided that its conclusion conflicted with its anti-industry message. In the late 1970s to early 1980s, Florida produced roughly 100,000 barrels of oil per day (b/d), but that number has dwindled to less than 10,000 b/d over the last decade, according to the Energy Information Administration. Florida is not currently a large producer of natural gas. Most natural gas in the state is produced from the Jay Field in association with oil production, and all of that natural gas is reused in closed-loop operations. However, since Florida ranks second in the nation for power generation – and 61 percent of Florida’s power is generated from natural gas – oil and natural gas production are important to Florida’s future. Thanks to advances in technology, new reserves are being discovered in the state and this has sparked renewed interests in exploration. In fact, DEP has received nearly 40 new drilling applications over the last few years and 37 have been granted. New reserves are being discovered throughout the country every day, and as technology advances, we have the opportunity to unlock more and more domestic reserves thereby lessening our reliance on oil from regimes with lax environmental safeguards and geopolitical interests contrary to ours. Thus, it benefits Floridians to consider Florida as a potential source of additional domestic energy. Only time will tell just how big the reserves in Florida will be. However, one thing that the history of American oil and gas production has taught us is that, despite the alarmist rhetoric of some activists, millions of oil and gas wells have been safely drilled and maintained throughout our country without incident. Florida should be no exception.